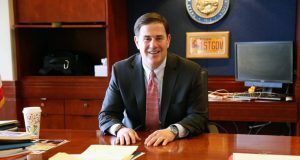 Arizona Gov. Jan Brewer is among dozens of governors who have received a letter that the FBI says could incite violence. Brewer spokesman Paul Senseman confirmed the letter on Friday. The FBI is warning police that an anti-government group’s call to remove governors from office could provoke violence. Investigators do not see threats of violence in the group’s message, but fear the broad call for removing top state officials could lead others to act out violently.